In 2014, the Galeria Toni Tàpies will celebrate 20 years of mounting exhibition activities at the vanguard of the art world. Since it opened, the gallery has established itself as a major presence on the Barcelona art scene by producing exhibitions of work by internationally-recognised contemporary artists, among them those who are just beginning to make a name for themselves and others with a consolidated career already behind them. To mark this anniversary, we will be organising a season of temporary exhibitions in which we will show a series of remarkable works from our collection. These exhibitions will focus on pieces that are of particular importance due to their artistic or historical characteristics or because of the media or techniques employed. In many instances, the shows will create subtle dialogues between works by different artists. The first in this season of exhibitions will present Maldito corazón (Cursed Heart) by Susy Gómez and Trinity site 8 (Partially demolished “Fat Man” bomb casing) by Jeff Brouws, two works that might symbolise and contrast love and hate. In Gómez’s work, the heart is a pump, supplying life and love, and is huge in size and simple in its almost childlike forms, but it is black in colour, a symbol of the pain and sadness that it often harbours, thereby revealing the up and downside of pure emotions. Jeff Brouws’ photograph is also related to the idea of force, not in this case of love but of destruction, a force injurious to life like the ideology that created a bomb for the purpose of wiping the enemy off the map. The remains we see in Brouws’ photograph – an almost abstract, minimalist image – give us an insight into the horrors of the atomic bomb, hate and devastation. Susy Gómez was born in Pollença and lives and works in Palma de Mallorca. 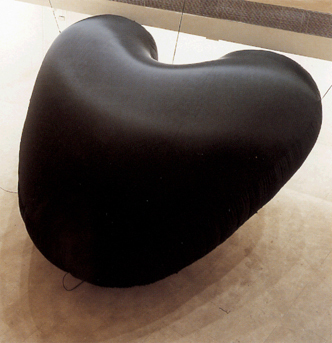 Her first exhibition at the Galeria Toni Tàpies, “Rendez vous”, took place in 1997. Gómez’s work is noted for the plurality of languages used and for its poetic expressiveness. Taking her own experience as her starting point, the artist invites the spectator to share a personal, private moment. The themes she explores often include autobiographical material and more hermetic subjects that contain figurative elements as well as others that are more abstract in aspect. Maldito corazón is a huge piece, an enormous blow-up black heart made of nylon with a fan inside it, giving it life. Installed in the first exhibition room in the gallery, this sculpture that reaches almost 4 metres high presents a disproportionately large black image accompanied by a constant, monotonous sound that intrigues and surprises the spectator. Originally intended for display in a museum space, the work is being shown for the first time in the gallery, as it has never been installed here before due to its large size, even though it has belonged to our collection for some years. Jeff Brouws was born in San Francisco. The Galeria Toni Tàpies presented his first exhibition in Spain, “Excerpts from the Narrative”, in 2010. Brouws has been portraying the cultural landscape of the United States for over 30 years in his work, which is closely connected with photography. Trinity site 8 (Partially demolished “Fat Man” bomb casing) is one of the photographs in the artist’s “After Trinity” series, images that are the result of his research between 1987 and 2009 into the US administration’s responsibility for the creation of weapons of mass destruction. Brouws visited the western area of the United States in search of the scenarios where nuclear weapons tests were conducted, including the spot where the first atomic bomb was exploded, the so-called Trinity test that the US government carried out in July 1945 in the state of New Mexico.